We have only white poinsettias left! 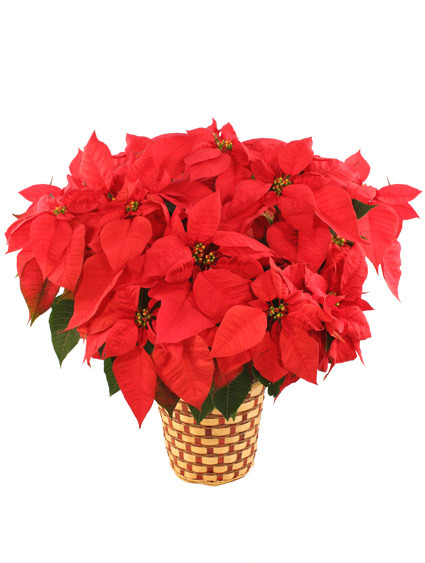 Beautiful, vibrant poinsettias. The $40 is vibrant red or white, while the $60 is a tri-colour. They all come wrapped with a big, festive bow. At over 2 feet in length with frosted mixed winter greens, pine cones and an elegant burgundy and gold bow, this door swag would look fabulous on any door. 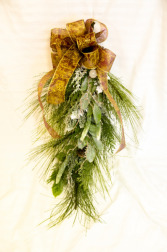 Centrepiece with keepsake ornaments, festive ribbon and a variety of long-lasting, fresh Christmas greens. Smells great! A lovely addition to any holiday table. 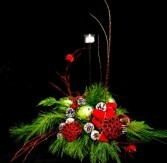 This silk arrangement is not just for Christmas. 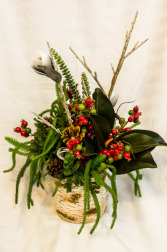 It has a seasonal feel, with magnolia leaves and flowers, evergreens, pine cones, berries and succulents, all beautifully arranged in a ceramic birch-look planter.